Three of Suzanne Lacy's Dinner Performances were included in Feast: Radical Hospitality in Contemporary Art, an exhibition organized by the University of Chicago’s Smart Museum of Art that presented the work of numerous artists who have all used the simple act of sharing food and drink to advance aesthetic goals and to foster critical engagement with the culture of their moment. 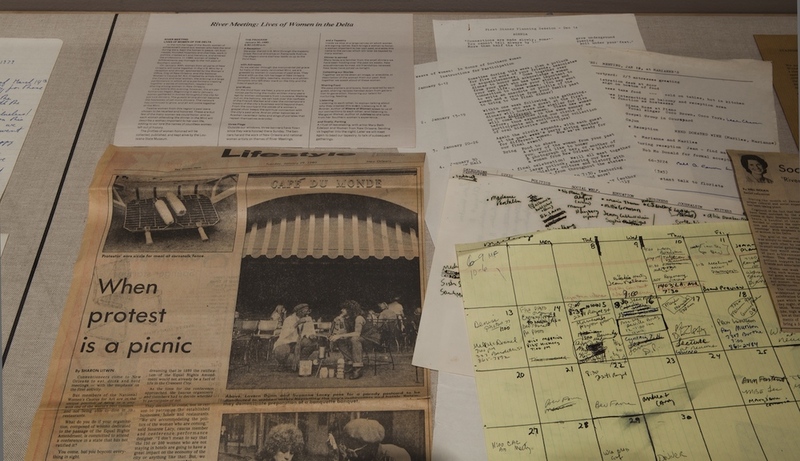 On view was archival material from International Dinner Party (1976) and a set photos documenting Boycott Performance and River Meetings, Lives of Women in the Delta (1981-1982). International Dinner Party (1979) was a simultaneous world wide dinner happening created by Lacy with Linday Pruess to publicize networks of feminist and development organizations around the globe on the eve of Judy Chicago’s Dinner Party exhibition at the San Francisco Museum of Modern Art. Participants of each dinner collectively drafted a statement about their experiences and sent these via telegram to the SF MOMA, where the location of their dinners were marked by Lacy with a red inverted triangle on a twenty-foot wide black and white map of the world. The telegrams were later displayed in albums next to the map. On March 14, 2012, the anniversary of International Dinner Party, Lacy invited participants throughout Chicago to host a dinner party in their home honoring a woman from their particular area. Stories and images from these dinners were collected on a dedicated Facebook page and in an ongoing archive organized by the Smart Museum of Art. Feast: Radical Hospitality in Contemporary Art traveled to the Blaffer Art Museum, Houston, Texas in fall 2013, and will be at SITE Santa Fe, Santa Fe, New Mexico, winter 2014.
International Dinner Party exists as a printed map, custom tacks, and an archive of telegrams, letters, ephemera and photographs documenting the experiences of over 2000 women and men that participated in the event. It is available for exhibitions. Please use the contact section on this site for more details.